Built by Richard D'Oyly Carte on the site of the old Savoy Palace, The Savoy Theatre has a long-standing history of productions including the comic operas of Gilbert and Sullivan. 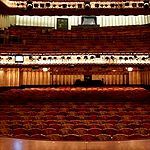 Do you work at Savoy Theatre? What did you think of Savoy Theatre?